I’ve just sent a new version of my free restaurant menu plugin to the WordPress.org repository. If you’re using this plugin on your site, you should see the update notice appear in your dashboard over the next few hours. Read on to find out the great new features offered by version 1.2. When you add the show_title and show_content attributes to the shortcode, the plugin will print your restaurant menu title and any content you’ve put into the body. This information is always displayed on the custom post type page, but now you can add it to the shortcode as well. It may require some extra styling to get it blending in with your menu. But the classic style has been updated so it should work out of the box in most cases. This version also adds support for menu footers. This was a great idea from Tom Frascone to make it easy to display dietary instructions, legal notices and other things. 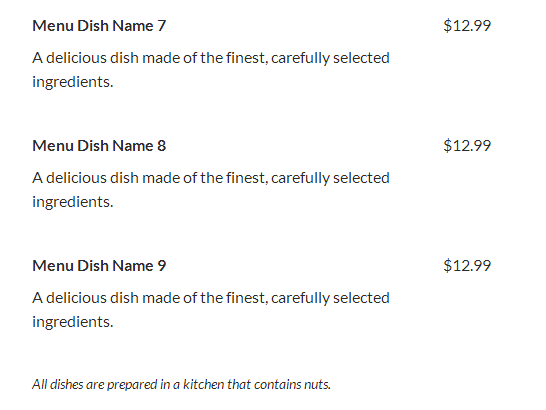 This is useful if you need to let people know that nuts are used in your kitchen, or want to add details about service charges. When you add or edit a menu a new metabox will appear with an editor. This text will appear below your menu on the frontend. This version also adds a .pot file to help you translate the plugin. I don’t have lots of experience with translations, so please let me know if you have any trouble using the .pot file. It’s been a good week for the Food and Drink Menu plugin. The daily downloads are increasing and we’ve gotten more great reviews. If you’re looking to build a restaurant, cafe, bar or eatery website and haven’t yet picked a plugin, check it out. It’s got an easy-to-use template system so it’s easy to blend in with any theme. If you want to follow the development, keep an eye on the GitHub repository or follow Theme of the Crop on Twitter.